Crystal Peak Design has been honored for the work they have created over the past 30 years.They have been recognized by numerous local, regional, National and International awards. 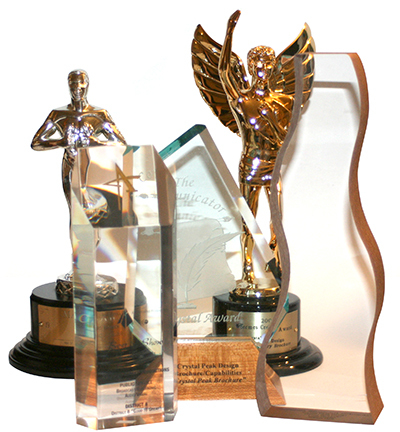 Below is a list of the awards received for logo design, corporate identity, brochures, mailers, web sites and more. for Brochure Design – Companion Habitats, Inc.
for Web Site Design – Crystal Peak Design, Ltd.
for Brochure Design – Crystal Peak Design LTD.
for Web Site – Crystal Peak Design LTD.
for CPD Web Site – Crystal Peak Design, LTD.
for Web Site – Superior Health Nutrition, Inc.
for KAO Box – Superior Health Nutrition, Inc.
for Capabilities Brochure – Crystal Peak Design, LTD.
for Web Site – Crystal Peak Design, ltd.